Wax Melter melting tanks and wax heating pots for candle making equipment. Melt Wax Fast & Save Time with the Fastest Wax Melting Tanks! 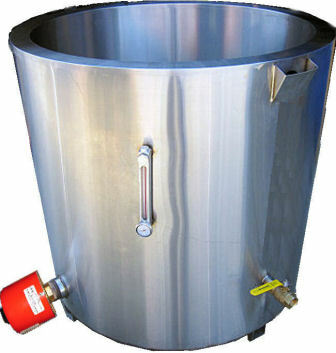 The Fastest Candle Wax Melting Tanks: WaxMelters wax melting tanks are the Fastest Melters for melting candle waxes and candle making. All we melt is wax, so if something was faster, we'd sell it ourselves. Designed Specifically For Melting Candle Wax: Unlike other melters which work with "rough" "inexact" materials like tar, solder and adhesives, our systems are designed to melt your candle wax fast using precise, accurate temperature controls and with even, consistent, and safe heating to prevent hot spots, fires, or damage and burning of your waxes, scents and colors. Don't take chances with your candle business: Our melters melt wax fast and protect your candle wax from damage. corrosion resistant for better quality candle making, fast color and scent changes without color and scent cross-contamination and easy clean up. Think about it: People who use melting tanks to melt glue or asphalt don't care about color and scent changes or burning wax with uneven heat. Melts All Candle Waxes: Our Professional Candle Wax melting tanks and pots are specifically designed for fast, safe and reliable melting of organic and inorganic, refined and semi-refined, petroleum, animal, vegetable and synthetic based waxes and oils, including Paraffin Wax, Soy Wax, Vegetable Wax, Palm Wax, Beeswax and more. Our wax melting tanks melt and heat waxes and oils, from wickless flameless wax (melting point of 90ºF), to organic waxes like soy (mp 120º-125ºF) to beeswax (mp 155º-170ºF) and up to paraffin, palm oil and gels (mp 170º-212ºF). The Most Energy Efficient Wax Melting: Our melters melt and heat your candle waxes and oils, not the room, and disburse the heat to melt your candle waxes most efficiently. High Grade Construction, Safe & Completely Welded: All melting tanks are made of the highest grade construction and are completely welded to give you many years of candle making use without rusting, chipping, or flaking. WaxMelters PW (Professional Water Jacket and Water Jacketed Melters) Candle Wax Melting Tanks: Fast Melting thermostatically controlled double boiler style melting tank provides the fastest, most even heating possible and no "hot spots" when melting your candle waxes and making candles. Ideal as a stand-alone or batch melting tank. Replacement heaters available for on-site maintenance and repair. Most Wax Melters In Stock & Ready To Ship! Custom Order. All Sales Final. No Refunds, Returns, Cancellations. If you're facing a special challenge and need a unique, customized affordable solution, then Waxmelters can help! Any size, shape, volume, temperature range and so on. "I purchased a melter from a well known company which advertises everywhere, especially on the web and usually ranks on top the search engines. I thought I could save a few dollars, but guess what happened when my melter actually caught on fire? Yes, the melter control box caught fire! Not once but actually twice! Even after I sent it back for repair. My whole warehouse almost caught fire. Imagine if I didn't have a warehouse and was working from my home? I jeopardized my company and employees. I lost months of production and had nothing but aggrevations all because I bought an inferior product. They waited weeks to get back to me. Even after I had to pay for shipping to have the burned melter repaired, it caught fire again! I complained but no one cared enough to help me with my defective melter. I didn't get a refund. Nothing. This company still advertises these same melters which caught on fire! Did this well known company which advertises everywhere even have insurance for the damages? No! I lost so much money and time and was left with only a burned up melter. Think you found a better way? I won't take any more chances with my business. From now on, I only purchase superior melters from Waxmelters." -David Vogel, President, KISS Candle Co. Specially Designed Direct Heat Melters for large amounts of candle wax. Primo Melters use high-grade stainless steel, specialized heating, insulation and precision digital control for super Fast, Safe, Even Heating with No Hot Spots. Primo Melters are also Round on Inside - Square on Outside for Faster Heating & Cleaning. 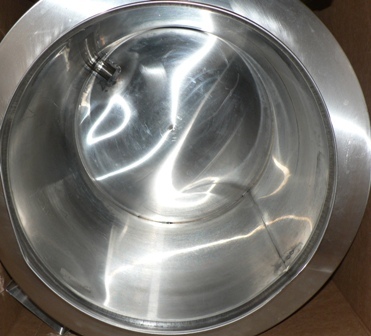 The Most Energy Efficient Candle Wax Melting Tanks feature a revolutionary heating element and ICC-ES recognized, Energy Star Qualified insulation with R-Values over 14 and rated to reflect up to 97% of radiant heat! Even heating of substances requiring 0-200° F (93° C) temperatures for melting. Strong, safe and completely welded fittings prevent leaking. Double walled melting tanks are strong and safe with a large filling area with a 1 inch (2.54 cm) male pipe thread dispensing outlet and a 1 inch (2.54 cm) female threaded ball valve and either stainless steel or lexan lid. CANDLE WAX MELTING TANKS vs "LOW WATTAGE MELTERS"
The Myth of Low Wattage Melting Tanks: If a company's energy efficient melting tanks and heating pots take 8 hours to melt your wax, then are they more efficient than our melting tanks and heating pots which melt your wax in 1-3 hours? Probably not. Kilowatt Hours: To calculate Watts used, you have to calculate the Watts multiplied by the amount of time it takes to melt your wax to calculate true energy costs. Also, the longer a melter takes to melt your wax, then the greater the heat loss which occurs to the ambient air temperature. In short, our melters, melting tanks and heating pots generally take 1-3 hours to melt your wax (under an hour for smaller melters and longer for 1000 pound melters), but if a lower watt melter took 6 hours to melt wax, then it would actually consume more than 3 times the regular wattage. More Energy Efficient Than Most Coffee Makers: With our careful design, materials and evenly heating melting tank, most of our melters use less Wattage than most hair dryers. Heat Conducting Tanks: WaxMelters exclusive proprietary inner melting tank surfaces and even, consistent heating, disburse the heat evenly to melt your candle waxes most efficiently. Other tanks use air (convection), do not heat as evenly or use lesser quality materials which regardless of Wattage, do not disburse heat efficiently. Save on Labor Hours: The longer you have to wait for your wax to melt, the more time and money you waste waiting. Also, with our rounded tanks with Wax Melter's exclusive proprietory surface, cleaning is much easier and faster which saves you more time and money. 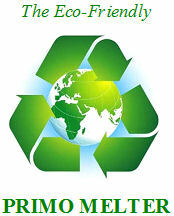 Bottom Line: We use the best parts and materials for your melting tanks, melters and heating pots. If something was better for candle making and wax melting, we would use it in our melting tanks, melters and heating pots. So the next time someone tells you their wax melter is energy efficient, ask them how long it takes to melt a batch of wax and you'll have your answer.